The spring cleaning bug is biting, so my "projects" for the week include whipping into shape my shamefully cluttered craft room. It's also the room where I tend to stash a lot of my tea-themed goodies (books, linens) and as I tidied up last night I marveled once again at the array of linens out there featuring a teapot or teacup motif. 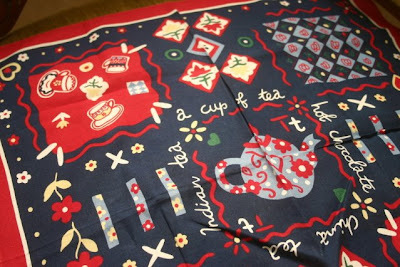 Like this tablecloth, which someone painstakingly cross-stitched with a tea design on all four corners. 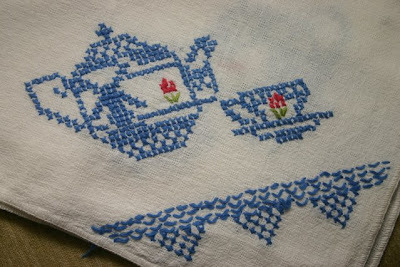 I found this recently on Etsy, very inexpensive, and can't wait to use it at an upcoming tea party. 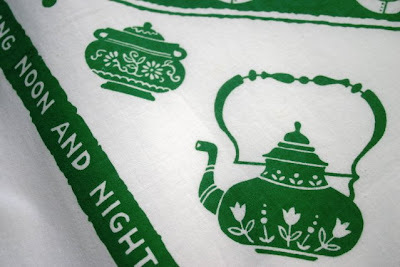 Many of you, like me, enjoy collecting tea towels. 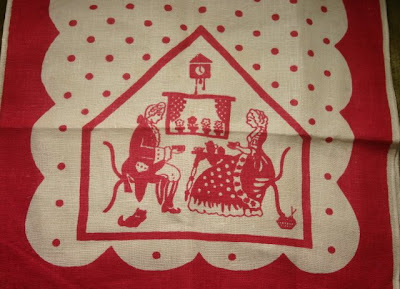 One I particularly like is this red design of a couple at tea, which can be pulled out at Valentine's, the Fourth of July and Christmas (or year-round if you're a red lover). Since we're all watching our pennies these days, I must say I've found that tea towels are still quite a bargain. 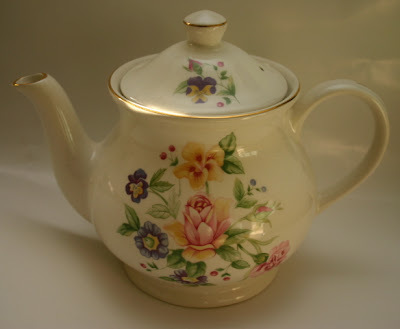 I recently bought four of them, all vintage ones with teapots on them, on eBay for just under $7.50 -- and that's *including* the postage. Not bad! 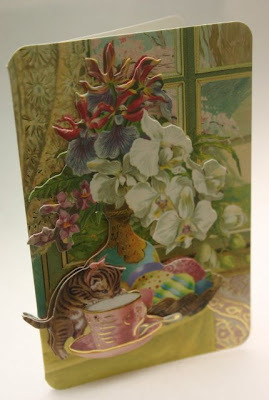 I have far more "creativity ideas" than I can possibly ever get to, but one of them is this: How about a line of greeting cards featuring vintage tea graphics? 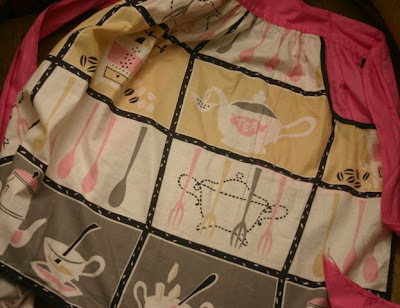 That is actually what attracted me to this sweet little vintage apron. I love that the teapot has an infuser on the spout! 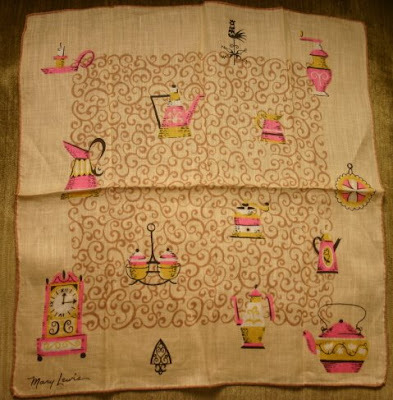 The retro look is featured in this Mary Lewis handkerchief. 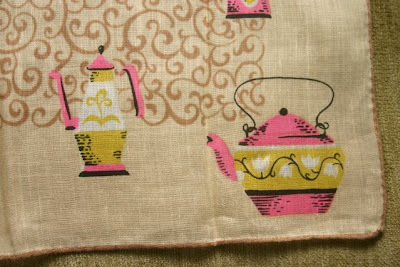 In the close-up, you'll note the detail of the tea kettle and, to the left of it, what one of our dear tea blogger friends would certainly point out is a coffee pot and not a teapot! Finally, I was reminded of my high school fondness for anything with an "Esprit" label when I found this Esprit scarf featuring teawares and tea words. Isn't it amazing (and wonderful!) 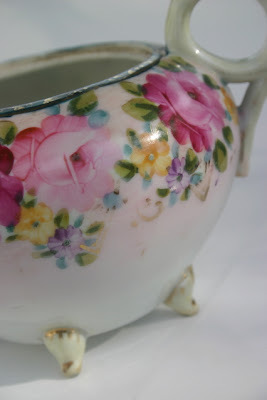 that so many designers have used teapots and teacups in their work? 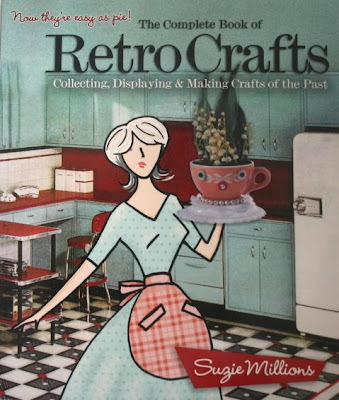 More than a year ago, I came across a delightful book called "The Complete Book of Retro Crafts" by Suzie Millions. 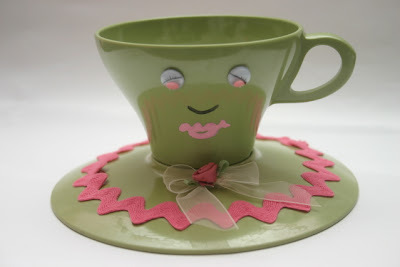 The cover craft of a "Teacup Cutie" is what caught my eye, and inside are the project instructions, including five more "cuties" made of all kinds of teacups, including good old plastic Melamine. I wanted to make one immediately, but on principle I was simply *not* going to pay more than $5 for a plastic cup and saucer. So I waited. And I waited. And finally came across this green set for $3! So, I've made my first "cutie," and although her lips could definitely be better (I'm no artist), I don't think this is too bad for a first effort. 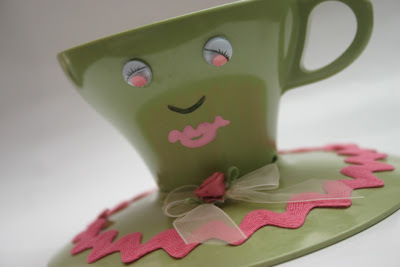 A teacup set, a little hot glue, some rick rack and ribbon, some googly eyes and paint, and you're done. This strikes me as the kind of thing that would be a great Sunday School or Vacation Bible School project if you could come across some solid color C&S sets for cheap. The book includes lots of diagrams for painting the lips, and the eyes, if you like, and that's just one of the fun projects in this book inspired by "kitschy treasures from the 1920s through the 1960s." If you can remember crafts made of seashells, bottlecaps, pantyhose and gum wrappers, you will definitely enjoy this blast-from-the-past book. 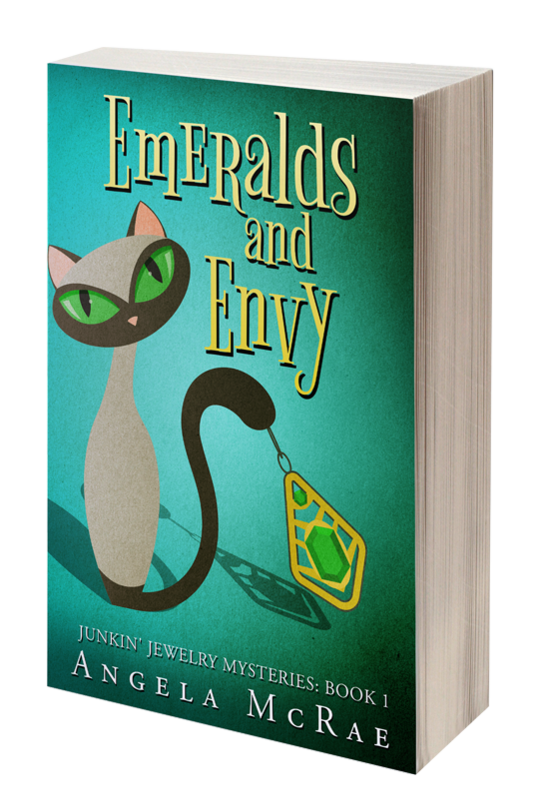 The author has a "Coming Soon" website here, and if you click on the link you'll get a nice peek at her retro style. 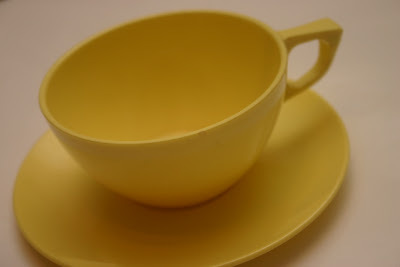 The week after I finally, finally nabbed my plastic teacup and saucer, I got an e-mail from my mom saying she'd found me a yellow set (for 50 cents) and would no doubt be able to find more when the warm weather yard sales kick in. 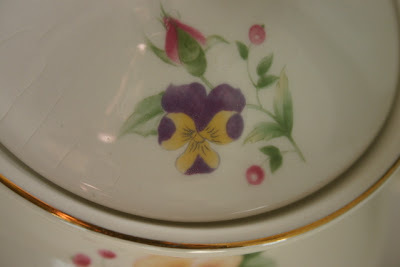 I see more "Teacup Cuties" in my future! This week an old friend dropped by the office, and a co-worker who knew I'd want to see her eagerly brought her and her family upstairs for a quick visit. My friend and her husband are missionaries in Japan, and they and their four precious little boys are here for only a very short time for a missions conference. I had just a brief time to quiz my friend on her tea-drinking habits, but I learned two interesting things: 1) Yes, she still drinks her old-fashioned, southern-style "sweet tea" there in Japan. 2) Her oldest son, who has just started school, like most of his classmates takes green tea to school to drink, because green tea and water are the only drinks they are allowed at school! That definitely piqued my interest in learning more about Japanese teas in the coming weeks. Dry leaf appearance: Very thin, dark green leaves. You know how you sometimes open a box of vermicelli and think wow, that's some skinny spaghetti? That's what I thought of when I opened this tea. Wet leaf appearance: This tea changed color very quickly, taking on a much brighter green hue almost from the moment the water hit it. Scent: This tea had a nice vegetal scent, sort of a "steamed asparagus" one but with a final note that struck me as citrusy, like a lemon. Maybe with a little butter, too? Flavor: Mmm! 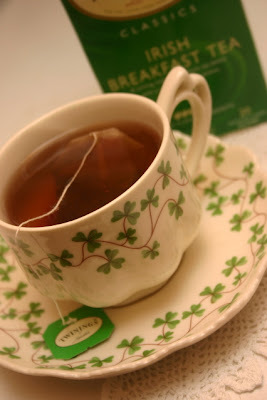 I liked this tea immediately, although I didn't experience the fullness of it at first sip. It seemed like a nice white tea, but about halfway through the cup I thought no, this is different from those light whites and has a richer taste. It's that "broth" taste again. I had several more cups of this tea and enjoyed it a lot, re-steeping it for about a minute and a half. 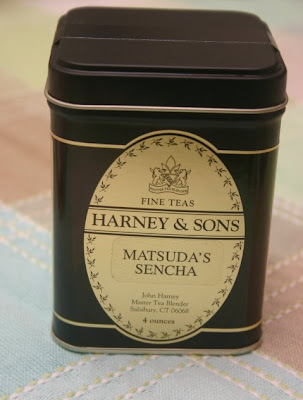 Additional notes: I was eager to read the Harney book to find out who Matsuda was and why he got a Sencha named after him. I fully expected some mysterious, ancient Japanese myth. 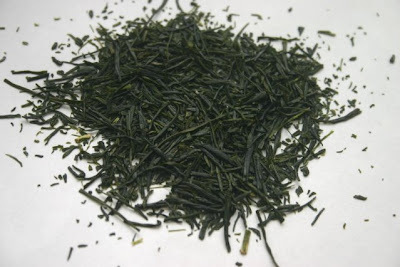 Imagine my surprise at learning Matsuda is simply the Japanese tea farmer who grows this tea! Let your tea take wing! Please tell me I'm not the last person to learn the term "brew-taché." That's the name of these new loose leaf tea bags I found at our brand spanking new Vitamin Shoppe out at Ashley Park yesterday. I had almost stopped by on Wednesday but ran out of time. So, when I opened up my Thursday morning Times-Herald and voila, there was a nice fat coupon for 20 percent off your *entire* purchase, I knew it was a sign. Nice! The kid-in-the-candy-store analogy always comes to mind when I am faced with a bountiful display of teas as I was yesterday. There were brands and flavors I'd never seen before, so I bought two new teas to try. 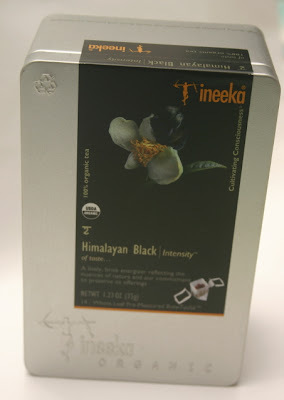 I'll tell you about the other one another day, but this organic Himalayan Black tea from Ineeka definitely caught my eye. 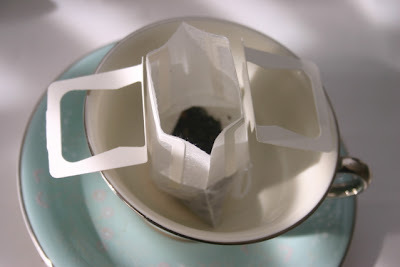 In addition to the nice tin, I was intrigued by what is perhaps the most thoughtfully designed "tea bag" I've ever seen. It's actually "a graceful alternative to the tea bag," the company says. 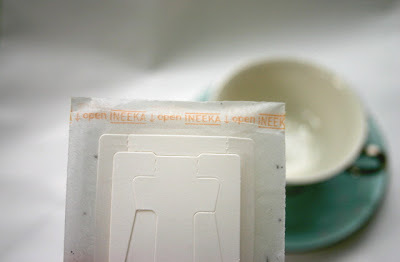 Ineeka gets an A+ for its directions, which were clear and easy to follow. You open the bag by tearing off the paper strip at the arrow. 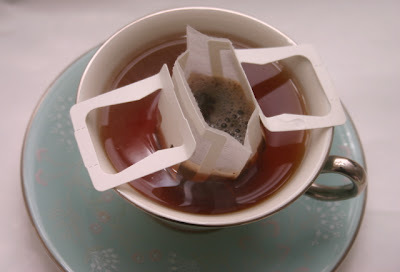 Next, you carefully unfold the "wings" so they can sit atop your teacup. Then, you pour on the boiling water and let the tea steep. I steeped this one for 4 minutes, and the result was a delicious and somewhat brisk cup of tea, just what I needed to soothe my allergy addled throat this week! I still can't believe I've never heard of this company or these teas before. Have any of you? 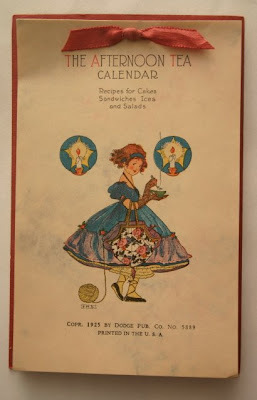 This little box, just about 4 x 6 inches, holds "The Afternoon Tea Calendar: Recipes for Cakes Sandwiches Ices and Salads." Or so it says, because I find not one single cake recipe in this booklet! 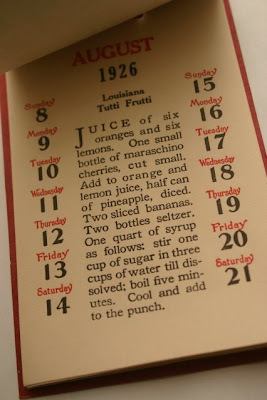 What did make it into the tea calendar? 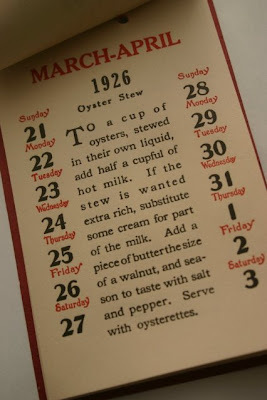 Oysters a la Poulette, Oyster Stew, Oysters a la Somerset, Pan Roast Oysters (observant readers will have detected a theme), as well as various other recipes for seafood, sandwiches, fruity salads and some luncheon type fare from the time period. 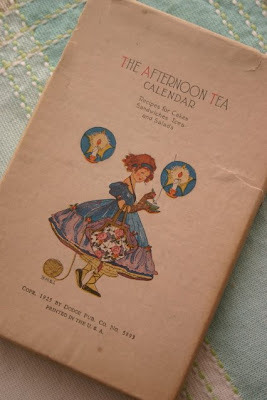 Although I like vintage tea-themed ephemera of any sort, what drew me to this calendar was the idea that I might craft something similar myself one day. There are two small holes punched at the top of each page, so the pages are "bound" merely with this small ribbon. 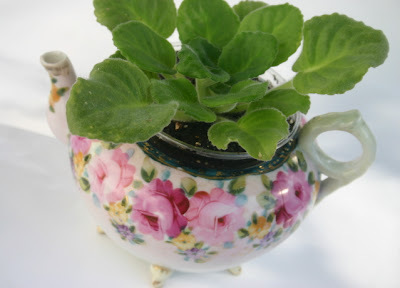 Wouldn't this be fun to make as a tea party favor for your girlfriends? 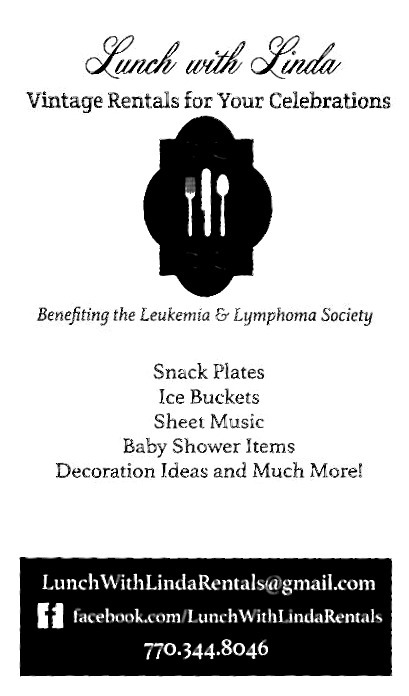 Or those of you who plan the teas at your church, wouldn't this be a sweet idea for a take-home treat at each place setting, maybe listing the recipes served that day? Naturally, I haven't done anything with the idea myself just yet, but since you all often come up with better ideas than I do, I thought showing this now might encourage some creativity later! Over a long weekend, Alex and I were blessed to stay at the lake house of some friends on Lake Wedowee in Alabama. Since Saturday was his birthday, we drove into Birmingham that night to have dinner at a restaurant we'd both long wanted to try, Frank Stitt's Highlands Bar and Grill. 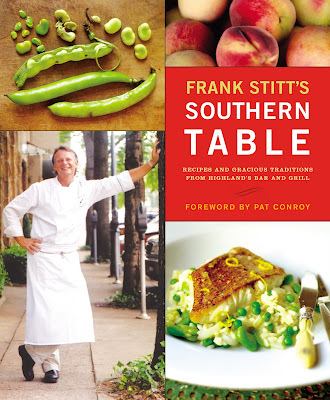 Stitt published his first cookbook, "Frank Stitt's Southern Table," in 2004, and it was a huge hit. The foreword was written by the inimitable Pat Conroy, and his elegant food descriptions alone would make you want to try the place. (It doesn't hurt that Highlands was named #5 on Gourmet magazine's list of the 50 Best American Restaurants.) Some family members in Alabama had recommended the restaurant as well, so off we went. Alex wasn't even finished with his appetizer before he started raving over his meal (he'd ordered the pork loin). Like him, I have to say it exceeded my already-high expectations. I had Tasmanian Salmon with new potatoes, sugar snap peas and English peas, and I never knew a vegetable could taste so good. (And I'm a veggie lover to begin with.) What capped it off for me, besides watching my man enjoy his birthday dinner, was when we decided to share a dessert and he found the perfect one, a Dark Chocolate Espresso Tart with dark chocolate espresso filling topped with a scoop of rooibos chai ice cream. Could ice cream really taste like rooibos tea? Indeed it did! The tart was just incredible, and plated beautifully (as was everything else). And I was pleased they offered Harney and Sons teas, so I ordered the Paris blend to accompany my dessert. Now, if I could just figure out how to make that ice cream. Or, if any of you decide to dine in Birmingham and would like to bring back a pint for me (along with the special of the evening, of course), I'd be much obliged. Wow, this was fun! Yesterday's post got lots of entries, and the winners are Melanie, Belinda, Sheri and Connie A.! 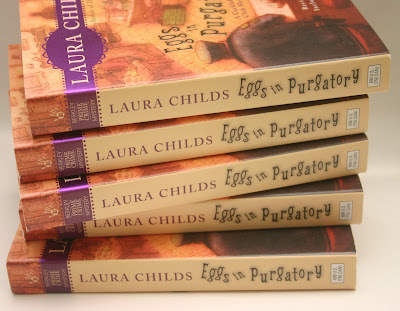 If you'll send your snail mail addresses to angela@newnan.com, I'll get these books packaged up and in the mail. And thanks to ALL who entered. I sooooo enjoyed hearing from readers old and new -- you ladies made my day! Today's Singalong: "I'm a Lidless Teapot"
But do like Linda of Friendship Tea says and buy me anyway (especially if I'm just $5) and do not doubt! *Today's blog post was inspired by Linda J. 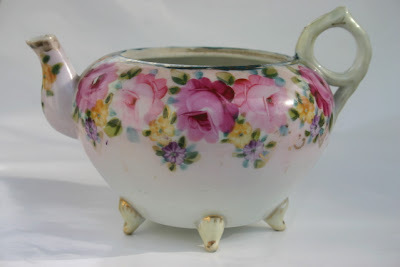 's March 6 post titled "Teapot Without A Lid." Since it's still a little early to plant anything outside, I've been playing around with a few houseplants, and I can't help noticing that Linda's recommendation is both a pretty and a thrifty means of displaying plants! A giveaway with four winners! 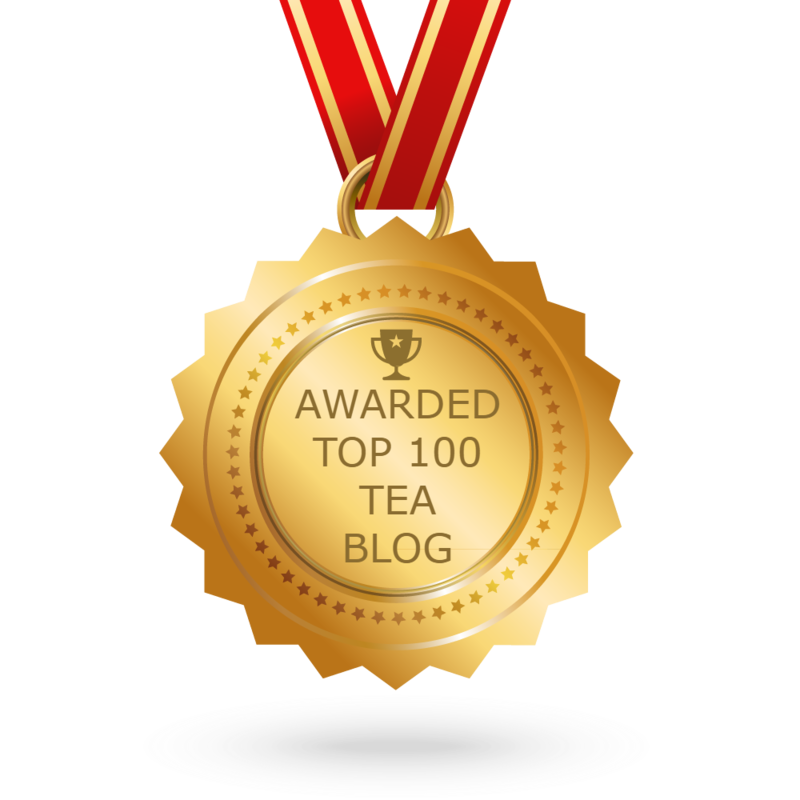 About the time I was giving away that extra copy of Laura Childs' "Oolong Dead" a few weeks ago, I got a lovely e-mail from the author herself (whose real name is Gerri Schmitt), thanking me for my review and also noting that the comments about her tea shop mysteries from you blog readers were "just so wonderful and heartwarming." 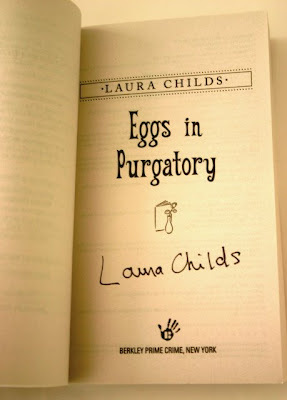 Now isn't that neat, knowing that an author we like enjoyed reading our words about her work? She also asked if I would be interested in giving away some copies of her new book in another series she is writing, and of course I said yes. 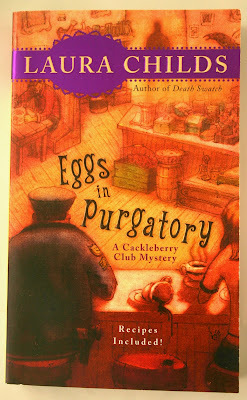 I haven't yet read "Eggs in Purgatory," first in the Cackleberry Club Mysteries, but Gerri/Laura (I don't know what to call her!) says the book is "about 3 forty-plus women who run the Cackleberry Club cafe. 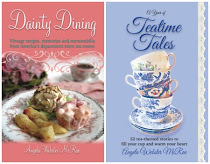 Besides a fun mystery, the book also includes tea, recipes, knitting, cake decorating, and a dash of spirituality." So I'm game to check out this new series. Are you? I'll be keeping one of these books to read myself and giving away the other four, and all of them are autographed! So if you'll leave a comment between now and 7 a.m. tomorrow, you'll actually have a pretty good chance of winning one of these books. Good luck! 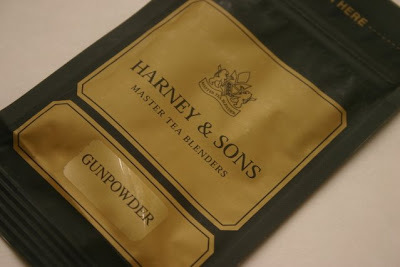 So, this week's tea has the curious name "Gunpowder." Interesting. Now may I share the funniest headline I've read in ages? You know, I'm sure, how there's been all this hullabaloo in the press about our first lady's propensity to wear sleeveless dresses. I'll be the first to admit I'd love to have arms as fit as hers, and I personally think the fashion naysayers are just jealous. But one article I read was titled "Michelle Obama's Right to Bare Arms." Bare arms. Get it? On "Gunpowder" day? Oh, never mind. Just enjoy the weekend, everyone, especially those celebrating birthdays today, like my sweet husband Alex, my dear friend Nikki, and my tea blogger friend Steph! 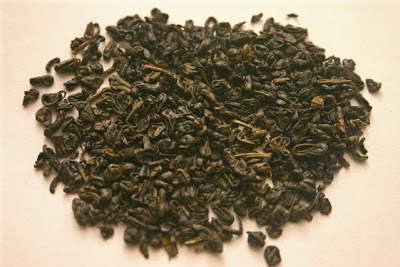 Dry leaf appearance: Very tightly curled, wiry little tea leaves of a deep, dark green color. Can't help thinking of them as "pellets," because I've read for years that Gunpowder tea is so named because it resembles old-fashioned gunpowder pellets. Wet leaf appearance: Eventually I am going to tire of writing "looks like chopped spinach," but this is another tea where the tea leaves have a bit of a choppy appearance - although I will say that this time I actually thought "chopped collard greens." 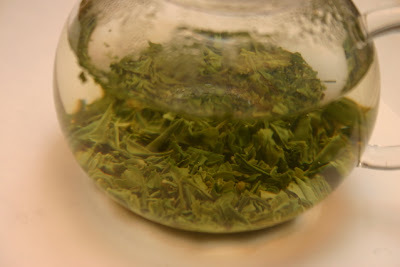 Steeping temperature and time: 1 teaspoon of tea, 175 degrees, 3-4 minutes. 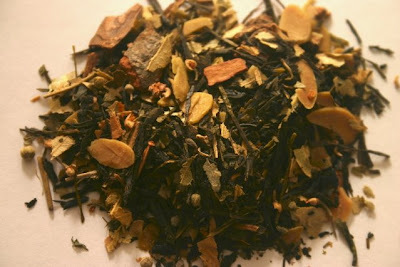 Scent: This tea had an interesting combination of what I'd call "roasted" and "smoky," and I actually thought of barbecues and grilling when I was trying to discern the fragrance! There was a faint reminiscence of Lapsang Souchong (which I absolutely detest -- that one's gonna be a problem for me when it rolls around for tea tasting), but faint enough that I could ignore it and move on. Additional notes: There is so much good info on Gunpowder tea in the Michael Harney book, I definitely recommend reading the whole passage. This time my favorite bit was learning that in processing Gunpowder tea, "the oven is designed like a Laundromat dryer, tumbling the leaves over and over in a hot metal cylinder." Waiting has never been my strong suit. And if I get a new item of clothing or a new purse or piece of jewelry, I want to wear it right then, or at least by the next day, not to have to wait for a special occasion. But when I got this beautiful teapot as a Christmas gift from my friend Beth, I knew immediately that this was a piece I would be saving until Spring! From the soft pink of the rose to the gentle yellow of the pansies, this combination definitely makes me think of what springtime looks like here in the South. Several times over the past three months I have reached for this teapot, a vintage Sadler teapot, and thought of using it, but it just didn't seem right. 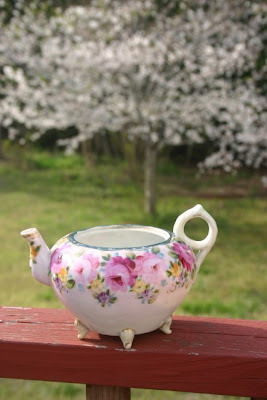 I'm not saying I will never use this teapot outside of Spring, but for some reason I wanted to save this as a treat this year, a reward for having endured another Winter! A pansy and a rosebud. Now could there be a sweeter combination on this teapot's lid? I *love* that there is even a tiny bit of crazing showing on this piece. Crazing, the experts say, is sometimes simply an indication of old age. (I think we call it "wrinkling" on humans, but now I think I'll start referring to it as "crazing" instead.) And here's hoping you have a very, very happy First Day of Spring! Sometimes I debate when and if I should mention certain things on this blog. Like ... would you rather I wait and tell you about the adorable little tea-themed Easter cards I found at Barnes & Noble two days before Easter, when it's closer to the holiday but they're probably all gone, or would you like to know about them in time to take your $1.95 over there this week while you can still get one? Yes, I thought so. 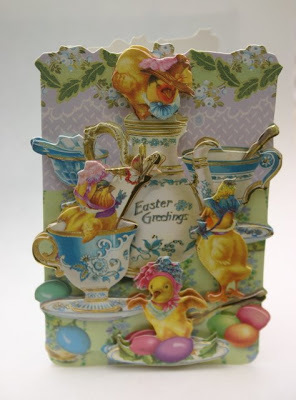 This one, "Chick Tea Party," is the prettiest of the two I bought. It's about 3-1/2 x 5 inches, and I hope you can see the dimensional effect and the gilded touches. It's really a lot of "card" and "workmanship" for the price. And this one, titled "Eggs & Vase," isn't quite as jazzy, but it has a pink teacup on it, so I got it, too. I actually bought these as "collectibles" (I've become obsessed with tea-themed graphics) and to decorate with, not to actually send to anybody! They're by Punch Studio / The Gifted Line, names I'll bet are familiar to fellow stationery junkies. 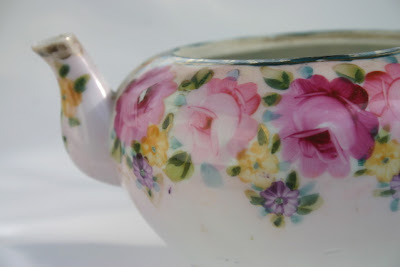 Today, by the way, marks my last tea blog post of Winter, because tomorrow we welcome Spring! I've got a special tea item I've been squirreling away in the tea cabinet, refusing to even use before March 20. Can you guess what it is? My mom had been hankering to return to some of our favorite shopping spots in Rome and Adairsville, so on Saturday we headed out, and at an antique mall in Rome I came across this sweet set of vintage teacup potholders, priced 5 for $6.95. 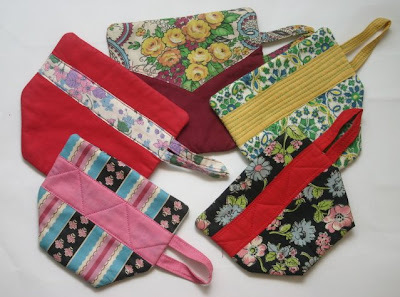 If these had been new they wouldn't have appealed to me, but I liked the odd mix of old fabrics. 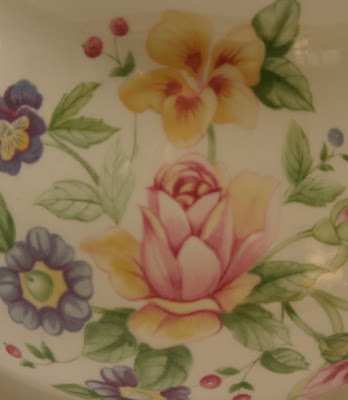 Each "teacup" measures about 5-3/4 inches at the widest part, and the "handle" or loop is about 2-1/2 inches. 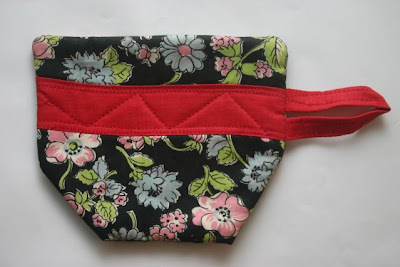 I feel quite certain the seamstress was working out of her scrap bag, because why else would she have chosen red to go with this pretty floral fabric! This yellow one is a bit better matched, and it has its own charm with sort of a sixties vibe. 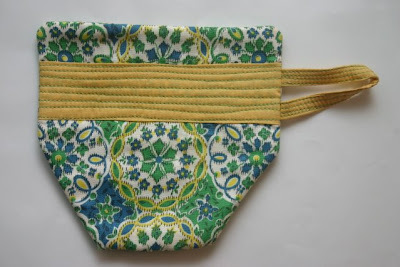 If I ever run out of stuff to sew, I think it would be quite easy to duplicate this design, don't you? Happy St. Patrick's Day, everyone! Here's a little postcard I found a while back that I wanted to share with you today. Only a fellow tea lover would appreciate this! And after all my protesting about not liking certain shades of bright green the other day, guess what I just bought -- and love? This tea towel! 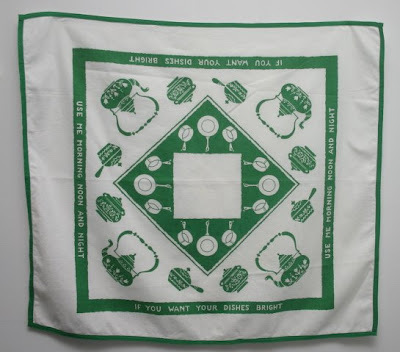 It's a large one, and squarish, definitely not big enough for a tablecloth, but I love it. "If you want your dishes bright, use me morning, noon and night," it says. Let's not take that little saying too seriously, though! 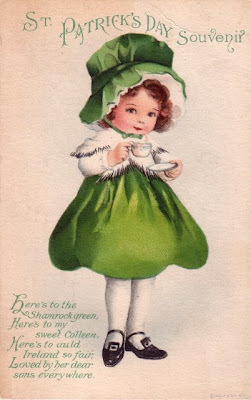 Will you be celebrating St. Patrick's Day in any way today? I made Mint Chocolate Chip Brownies I'll be taking to the office, where I'll maybe share some Irish Breakfast Tea with the tea drinkers there, and then DH and I will be having Corned Beef and Cabbage for supper, assuming the crock pot does its job. And you? 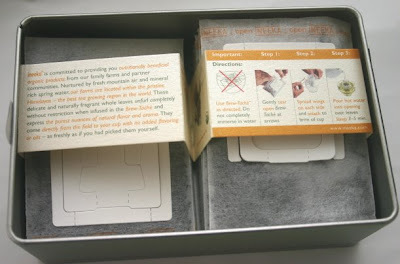 At gift shops and tea rooms in both the U.S. and the U.K., I have seen these little rectangular recipe booklets from J. Salmon Ltd. in Kent. Because I did not have an Irish edition, I ordered this one from a seller on Amazon.com. 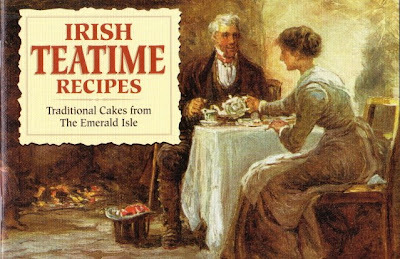 "Irish Teatime Recipes: Traditional Cakes from The Emerald Isle" has 34 recipes for cakes, shortbread, scones and other goodies. 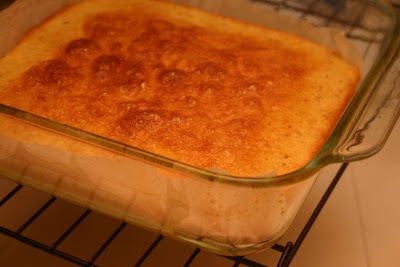 I'm ready to start celebrating St. Patrick's Day, so yesterday I tried this recipe for Almond Cake. I tweaked the recipe a bit and converted some measurements, so here's how I made it. Preheat oven to 400 degrees. Cream butter and sugar, then add beaten eggs one at a time, blending well after each addition. Add flour and baking powder and blend. Add almonds and almond flavoring and mix just until combined. Pour mixture into an 8-inch-square glass baking dish lined with parchment paper (or sprayed with cooking spray; I did both and it was overkill!). Bake for 20-25 minutes until slightly browned and a knife inserted in the center comes out clean. Let cool on a wire rack before cutting into slices. 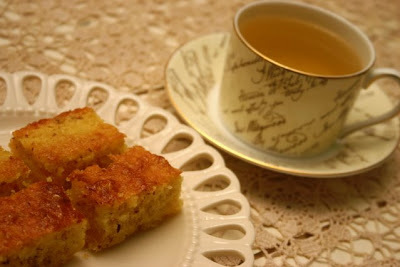 Makes a very moist, spongey cake with a nice little crunch from the ground almonds. According to this book, "Almonds provided a flavouring that was especially popular in the 18th and 19th centuries." I like the flavor of almonds myself, so to go with my Sunday afternoon treat I had some of Upton Tea Company's Sweet Almond Green Tea. The loose tea is simply loaded with almonds, so it's no wonder this tea has such a great almond flavor! "Somebody went to Charleston ..."